I am creating a new thread. If we can predict SIE/SIA, why not SWE? I have included the below for my first guess. The pink dots show where we would be at if the current anomaly vs. normal (about 800KM^3) persists). The pink line is "normal" between the standard deviation curves. The first pink dot is our current position. The red line is my guess. The green line is when we fall below normal peak SWE of approx 1,100KM^3. I believe this will happen around 5/15 (approximately two months later than normal). April melt usually results in a SWE loss of about 500 KM^3. May melt usually results in a loss of 300KM^3. And June takes care of almost all the rest (another 200 KM^3 or so). This is very interesting for several reasons. Even if we reduce the absolute anomaly, as we move forward, even losing mass as fast as most years will result in a widening RELATIVE anomaly. I anticipate we will see about 100KM^3 of melt in April relative to 4/1. That is 1/5 of normal. But May is likely to be a different story. Even if May is 2X normal, that is only a 600KM^3 loss. 1.5X normal April losses would be a 750KM^3 loss. Something in that range would seem reasonable. That puts us at about 800KM^3 remaining come 6/1 (IMO). While that is only 600KM^3 more than normal -- a bit less than where we are right now (1,550KM^3 vs. 800KM^3), the RELATIVE difference becomes absolutely jaw dropping. While we are currently at 2X normal volume (or approaching), by 6/1, we are likely to be at 4X normal volume. In fact, continuing very aggressive melt would still yield 200-250KM^3 left by 7/1! At that point, insolation begins to drop. 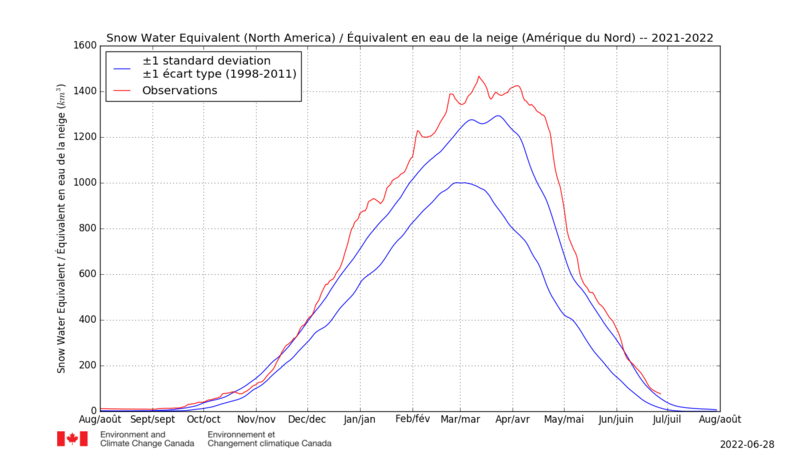 But how much does it have to drop and how open does the Arctic have to become for gains to start again? This begets another major question. Snowpack has been shown to have a shielding effect for ice cover. Will a SWE anomaly of 2-4X normal shield Hudson Bay substantially more than normal, creating additional feedbacks as we head deeper into summer? For this thread's purposes, I think we should have a deadline of 5/1. I may revise my graph by then, to be either prettier, or somewhat different. I welcome others' contributions and look forward to seeing how wrong I am come late summer. Snow melt amount is dictated by snow available to melt, when the warm weather arrives. The more snow there is, the more snow will melt. If all this extra snow remains on the ground on May 1st, May could easily see 4x or 6x of normal melt. I've hand-drawn a random line just to counter yours, though I feel that melt could go even faster. Actually, it mostly depends on new snows coming along, rather than on the existing snow. To get better answers, snow distribution should be examined, with climatology dictating when each location is expected to lose its snow cover, and bearing in mind that deeper snow does not substantially last longer in a given location compared to normal snow unless that location is very protected from external warmth somehow. But as the geographical database is not available afaik, and as I doubt this merits such an investment of one's time, I'll settle for this guess. My only question to you bbr - should you turn out to be very wrong by the end of summer, and the snow doesn't last much longer than usual, despite its unusual depth, will you still continue to preach the coming ice age? I think you may be confusing snow cover over sea ice - which has a substantial shielding effect - and land-based snow - does it have any shielding effect at all, I'm not sure. Snow melt by end of summer does not mean an ice age is not coming. But the longer it takes, the more likely it is. If everything disappears by 6/1, I think it will certainly show we need much more SWE than currently exists to have follow-along impacts in summer, but I think the contrary occurs. Also, your graph is already wrong. 4/15 data out. Increase! Also: I would argue May will not see 4-6X normal melt. There is an upper limit to melt, IMO, which is due to melt itself (i.e. freshwater runoff begets cold/more snows). The farther we go past May's normal losses, the more the freshwater runoff will impact additional potential losses. Point 2: I believe you are incorrect re: land snowcover. There was a post in another thread recently which said as much as it does help to buffer melt (as we saw last year across Eurasia in particular). Snow over sea ice insulates, snow over land buffers airmasses before they can reach the sea ice. Final note: I think we are in for another few days of increases. This should all but guarantee we arrive at 5/1 with 1,250KM^3 or greater SWE. Melting 1,000KM^3 of SWE in 30 days would IMO be sufficient to trigger substantial AMOC impacts. And while I do think we see impacts due to the anomalous late + large melt, I do not think they will be nearly that large. When snow melts, some soaks into the ground and perhaps even feeds aquifers (some of which are in need of refreshment after over extraction), while most (?) is carried away by rivers. Where do the rivers go to? Is there any analysis of what happens to snow melt? The river maps attached are part of an on-going project. The thickness of lines reflects the average flow. This may not reflect what happens during snow melt. Note that a lot of the rivers feed Hudson bay. So how much of that snow melt will go to where it could disrupt the AMOC? Hi bbr .. is it not your graph that's wrong .. it ends on April fool's day .. can you update ? b.c. I am not sure what you mean? But happy to update! Leaving aside the effect of snow melt and the AMOC for the moment, discharge from the mighty Mackenzie river has been shown to have significant effect on melting the sea ice in the Beaufort Sea. So it seems a lot depends on how quickly/slowly the meltwaters are transferred into the Arctic. If the discharge from the melt is a slow process, it will have time to heat up and encourage Arctic ice melt. It will be another thing to watch this year during May and June, if we see the high SSTs emerging from the Mackenzie delta. I googled increased river discharge and the AMOC and found this paywalled article (I haven't read it). The effect of increasing Arctic river runoff on the Atlantic meridional overturning circulation (AMOC) was investigated using an ocean-ice coupled model. Results obtained from two numerical experiments show that 100, 150 and 200 years after the start of an increase in the Arctic river runoff at a rate of 0.22%/a, the AMOC will weaken by 0.6 (3%), 1.2 (7%) and 1.8 (11%) Sv. AMOC weakening is mainly caused by freshwater transported from increasing Arctic river runoff inhibiting the formation of North Atlantic Deep Water (NADW). As the AMOC weakens, the deep seawater age will become older throughout the Atlantic Basin owing to the increasing of Arctic runoff. And that is only .22%... we are probably way higher vs 10 / 20 yrs ago (maybe 22% or more). This was interesting so I googled around a bit and found a good source (in Swedish). This graph sums it up quite good. In Kiruna, a Swedish town north of the polar circle (67N) with about 5 weeks of midnight sun, the snow melts completely within one month starting mid April, regardless of initial depth. Average temps in May are between -1C and +7C. Interesting! It would be more telling to see the specific years that were high in May, I wonder if they are the same as the ones that had snow in June or if it is just a smoothing. Also found these excellent maps which show SWE daily! Finally: after rolling through the ^ SWE images, it seems we should see continental gains continue through the 18th, at the least. That means there are likely 3+ additional days of gains impending on the Canuck charts.